SINGAPORE, 20 Dec 2018 Following the first lineup announcement consisting of Korean pop group, Super Junior, KKBOX further unveils the stellar list of performers for its 14th KKBOX Music Awards taking place on 26 January 2019. Held at Taipei Arena, this upcoming awards ceremony will be themed “Music Beyond Imagination” and has proudly appointed world-renowned Norwegian DJ, Alan Walker, as its awards ambassador. The 21 year-old EDM producer is set to pump up the crowd and also, viewers from around the world! More heavyweight performers include popular singer, Bii, Japanese female idol group, Nogizaka46, and Taiwanese rock band, 831. Tickets to the 14th KKBOX Music Awards can be raffled from now until 9 January 2019. The raffle is open to all Singapore and Malaysia KKBOX Premium members. To qualify, premium members have to take on a music challenge made up of Mandarin, International, Cantonese and Korean hit singles in 2018, save the stipulated playlist and fill in your personal details. For more details, please visit KKBOX Music Awards’ official website. Besides attending and performing at the 14th KKBOX Awards, the Norwegian chart-topping DJ, Alan Walker, will also take on the role of awards ambassador for his first foray into Taipei Arena, where the awards ceremony is held. Always dressed in his trademark black mask and hoodie now, Walker first shot to international fame with his track, Faded, when he was 18. The song is still one of the highest viewed videos in YouTube’s history, with a staggering 2.1 billion views to date. Since its release in 2015, Faded has also topped all the major charts on KKBOX and is currently still on the Top Ten International Singles Chart. This year, Walker collaborated with K-391 once again and released a new version of Ignite, lending vocals from BIGBANG’s Seungri. The song has garnered 137 million views on YouTube since. With the release of his new single, Darkside, Walker scored a haul-trick and topped 7 charts on KKBOX charts, including Pop New Release Daily Chart, Pop New Release Weekly Chart, Pop Singles Daily Chart, Pop Singles Weekly Chart, International Album Weekly Chart, Electronic/ Dance Singles Weekly Chart and Electronic/ Dance Album Weekly Chart. Following the immense success of his singles, Walker released a brand new album Different World, in mid December, which looks set to the dominate the charts for the rest of 2018 and well into 2019. 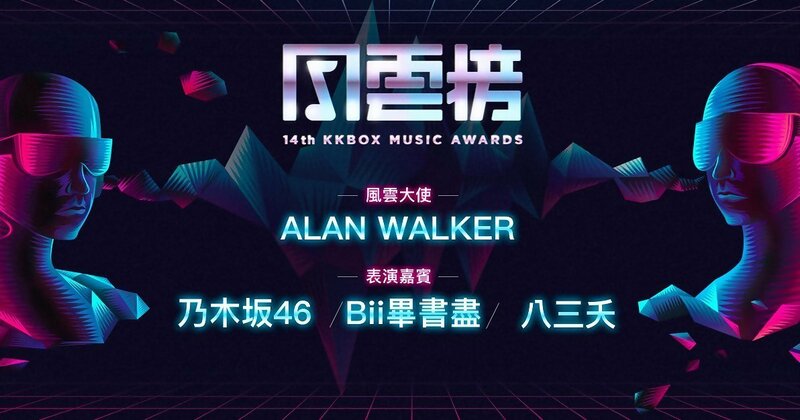 Apart from Alan Walker, kawaii Japanese female pop idol group, Nogizaka46, has also been confirmed as one of the star performers for the 14th KKBOX Music Awards. The group has sold more than a million records and saw more than half a million fans attend their 10 sellout concerts this year, cementing their status as the top female pop idol group in Japan. Nogizaka46 has always paid close attention to the Taiwan market. Besides taking on endorsement projects for convenience stores and app games, core member, Asuka Saito, also fell in love with Taiwan when she starred in the Japanese remake of the wildly popular Taiwanese movie, You Are The Apple of My Eye, which was partly filmed in Pingxi. Nogizaka46 has recently kicked off their world tour, and the first stop in Shanghai’s Mercedes-Benz Arena on 1 December was sold out. KKBOX fans will get to catch Nogizaka46 ‘live’ exclusively at KKBOX Music Awards, one day before their concert on 27 January 2019 at Taipei Arena. When the first lineup announcement for the 14th KKBOX Music Awards was made, many were surprised that Super Junior won the ARTIST OF THE YEAR, an award typically given to singers of Mandarin songs. Following their Singapore concert stop in January this year, Super Junior released their 8th studio album, Replay. With the support of their ELFs (Super Junior fandom) throughout Asia, all the tracks in the Replay album topped the K-Pop New Release Weekly Chart, making Super Junior the first and only artists ever to dominate the chart with all 15 songs from one album! Their first single, Lo Siento, a collaboration with American Latin singer, Leslie Grace, topped the Various New Releases Charts. With the song’s popularity in South Korea and unwavering support from the ELFs, Lo Siento emerged champion on the K-Pop Singles Yearly Chart. Super Junior has managed to stand consistently strong on the charts with their Play and Replay albums. Keep your eyes peeled for an exciting performance during the awards ceremony! Pop star Bii achieved exceptionally good results with his 5th studio album, Bii Your Light. Despite having only released digital singles this year, his single, Scars (聊伤), still achieved outstanding results and was in the Top 10 of Mandarin Weekly Singles Chart for 4 consecutive weeks and Top 100 Mandarin Singles in 2018! Busy with his concert tour, [My Best Moment], the heartthrob has had sell-out shows in Taipei Arena, Kaohsiung, Hong Kong and Malaysia! Always striving to improve himself, Bii’s performance is one to look out for in the upcoming KKBOX Music Awards. This will also be Bii’s fifth appearance at the KKBOX Music Awards. Sometimes, good things come to those who wait. 15 years since they first emerged in the scene, alternative rock band 831 finally made it to Taipei Arena this year! 2018 has been a fruitful year for the 5-member band. From being the ambassadors of KKBOX Future Stars风云之星活动 earlier this year, 831 went on to collaborate with Sammi Cheng on 眉飞色舞 PLUS, a remake of her record-breaking EDM hit song. In September, their concert, [The Great Nobody], was an immediate sellout. A second show was added and again, tickets were snapped up once ticket sales was launched. As part of their celebratory activity and true to their personable characters, the band members gave out 1500 sets of chicken cutlets in the middle of the bustling Ximending. 831 will also be holding their concert in Kaohsiung on 23 March 2019. This will be their first ever concert in Kaohsiung Arena. But before that, we can all look forward to see them rock the stage at the 14th KKBOX Music Awards!